Alaska cruise sale limited time saving, air credits and kid’s savings on available on Norwegian Cruise Line cruises through majestic Alaska. 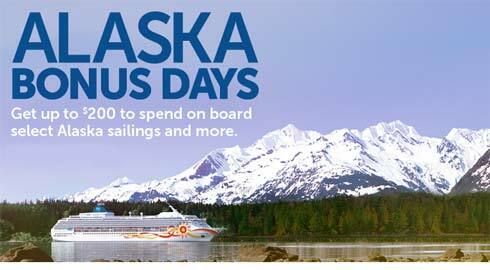 Those who book a new Alaska cruise reservation between Monday, April 1 and Tuesday, April 2, 2013, will receive up to $200 to spend on board. Air credits, up to $500, are also available on select sailings and this special offer is also combinable with exclusive military and AARP member discounts. Norwegian Sun sets sail to Alaska from May 13, 2013 through September 9, 2013, offering a series of seven-day cruises from either Vancouver, British Columbia or Whittier, Alaska, with fares starting at $399*. In addition to the Bonus Day offer, families cruising on Norwegian Sun with kids, ages 17 and under, who are sailing with two adults in the same stateroom will receive an additional 50% off their cruise fare. Guests who book an Alaska Cruise Tour in conjunction with their Norwegian Sun cruise will receive an additional $100 on board credit. Norwegian Pearl and Norwegian Jewel also provide guests with an unparalleled Alaska cruise experience as both ships set sail from Seattle to some of the most scenic Alaska destinations including Juneau, Skagway, Glacier Bay, Ketchikan, as well as a stop in Victoria, British Columbia. Norwegian Pearl sails a series of seven-day cruises every Sunday from May 19, 2013 through September 22, 2013, with fares from $549*. Norwegian Jewel sails every Saturday from May 18, 2013 through September 14, 2013, with fares starting at $499*.